'; // dc = dc + '. This column was written for and originally published in the The Globe and Mail (Online, Friday, August 30, 2013; Print edition, Saturday, August 31, 2013). Used with permission. Can you have a harvest picnic without the Harvest Moon singer? The answer is an unequivocal yes according to the acclaimed producer-musician Daniel Lanois, a participant and co-producer of the Greenbelt Harvest Picnic. Because of an injury to guitarist Frank (Poncho) Sampedro’s hand, Neil Young and Crazy Horse cancelled a number of appearances, including a headlining slot at the annual celebration of music and local farmers in Dundas, Ont. 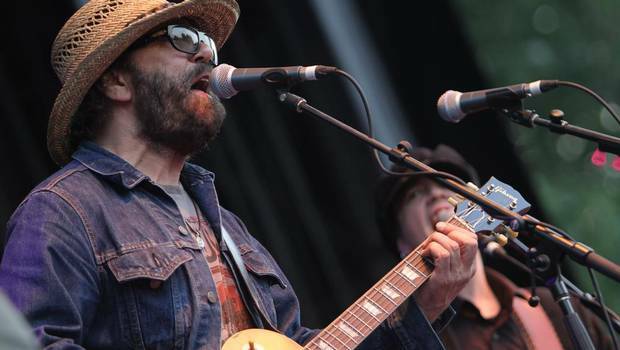 We spoke to Mr. Lanois about the event which still boasts Emmylou Harris, Gordon Lightfoot, Whitehorse and others as featured performers. I'll ask the obvious question about Neil Young and Crazy Horse cancelling their appearance at your festival. Why doesn't Neil just come and play solo? That's the natural response and instinct. Why not show up and do something else? People would have been just as happy to hear Neil sing non-Crazy Horse material. I didn't speak to Neil about this, but I believe it was asked of him. The response from his manager was that his head was not there. You and Neil have a relationship. He didn't give you the news personally? I heard from him about three weeks back. He was excited about coming in. But I guess the injury happened since. The communication since then has just been through an agent. So, what happens when you get bad news like this? Well, my thought was to see if we could get someone else to fill that position. Lucky for us, Gordon Lightfoot made himself available. And I can't say enough about it. What a great guy to help us out so late in the game. I mean, we're right down to the wire here. But, one great Canadian icon fills in for another. That's how I'm looking at it. You two have a history as well, right? I've known Gord for years. He presented me with my lifetime achievement award. I think I have a star on a sidewalk somewhere in Toronto and on the night they presented me with the Walk of Fame award Gord was very sweet. So, that's a man I have a very high regard for. And not to make any comparisons, but I'm fine with Gord coming in to save the day. Since that confirmation, I've been at peace with the whole thing. Have many people asked for their money back? I believe J.P [Jean-Paul Gauthier], my partner in this, has offered a partial refund for the cancellation, and that's very sweet of him. So, that's where we're at. We get to hear Gordon Lightfoot. How great is that? I think it would be an affront to Lightfoot if anyone asked for a refund at this point. Who would have the gall? Hey, I would have paid more to see him [laughs]. But we've got Martha Wainwright coming in as well. She's an old friend. I knew her mother. There is a family aspect to this festival, whether it's the crowd or whether it's the musical family. That's still intact. We feel good about what we're doing, and we're rolling up our sleeves to make this a special day. Speaking of family, is Neil's wife Pegi Young and her band still playing as planned? Oh, yes. She's playing earlier in the afternoon. We're looking forward to having her. And maybe she knows something that we don't. Who knows? Greenbelt Harvest Picnic, Aug. 31, noon. $99.50 (youth aged 11 to 15, $19.50; children 10 and under, free). Christie Lake, Dundas, Ont., 1-855-985-5000 or ticketmaster.com. Gordon will be touring again in 2019! Looking for CDs, vinyl or DVDs? Lightfoot & more?